Jobs in the U.S. increased by 219,000 in July thanks to more hiring as companies got a boost from lower corporate taxes, according to ADP and Moody's Analytics. The Federal Reserve's policymaking arm improved its rating of the U.S. economy, but elected to forgo another interest rate hike in August. The yield on the benchmark 10-year Treasury note hit 3 percent Wednesday morning after data showed private payrolls increased more than expected last month. It was the first time since June the yield was at the 3 percent mark as investors renewed bets on a stronger economy and higher inflation. 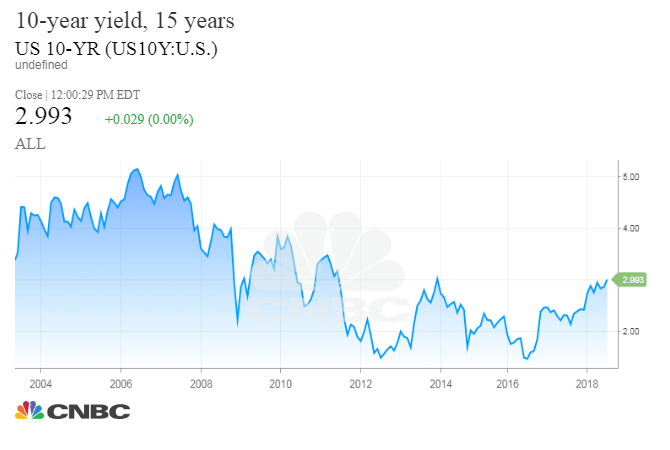 The 10-year yield is a benchmark for mortgage and auto lending rates. As widely anticipated, the central bank's Federal Open Market Committee voted unanimously to keep the target range for its benchmark rate at 1.75 percent to 2 percent. The statement said the labor market has "continued to strengthen." However, the committee went on to note that "economic activity has been rising at a strong rate," a more bullish view than the June characterization of "solid" growth. The yield on the 10-year Treasury note was last 3 basis points higher at 3.003 percent at 4:44 p.m. ET, while the yield on the 30-year Treasury bond was up 5 basis points at 3.13 percent. Bond yields move inversely to prices. "The most notable change within the FOMC statement was the Fed's characterization of economic activity; it went from 'solid' in June to "strong" today," Ian Lyngen, head of U.S. rate strategy at BMO Capital Markets, said in an emailed statement. "There was no nod to the drop in core-PCE year over year, but that is to be expected as 1.9 percent is effectively at the 2 percent target and therefore the Fed's 'remain near 2 percent' language is more than appropriate." Jobs in the U.S. increased by 219,000 in July thanks to more hiring as companies got a boost from lower corporate taxes, according to ADP and Moody's Analytics. Economists polled by Reuters had predicted a gain of 185,000. July's job gains were the best since February, when 241,000 jobs were added. Jobs growth for the previous month was also revised up to 181,000 from 177,000. Also contributing to the uptick in yields was a government announcement to sell an additional $30 billion worth of bonds in the second quarter. The Treasury Department is adding a two-month note to the offering of debt securities; the sum compares to a $27 billion increase for the first quarter. The moves come as Washington struggles to find options to help handle a budget deficit expected to eclipse $1 trillion in the next two years. The national debt is at $21.3 trillion, having risen about $800 billion in 2018. Concerns surrounding trade continud. According to a Reuters report, citing a source, the Trump administration is looking at the possibility of slapping a 25 percent tariff on $200 billion worth of imported Chinese goods — after initially setting them at 10 percent. This comes as tensions between Washington and Beijing ramp up, and show no signs of easing.